Happy New Year! My final shirt for 2011 is another of the latest offerings to appear on the TMBG Merch Store. 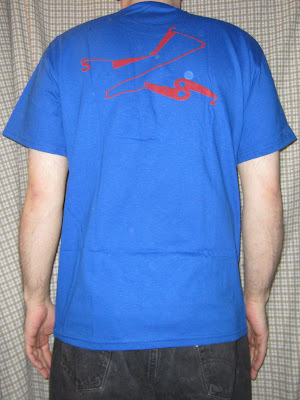 It's a red and blue masterpiece called "Nu Wave" that exhibits the band name in a very unique way. Each letter is proceeded by a red line of varying thickness and direction which leads to the next one. It would actually take some time for a passer-by to interpret the garment by following the path. 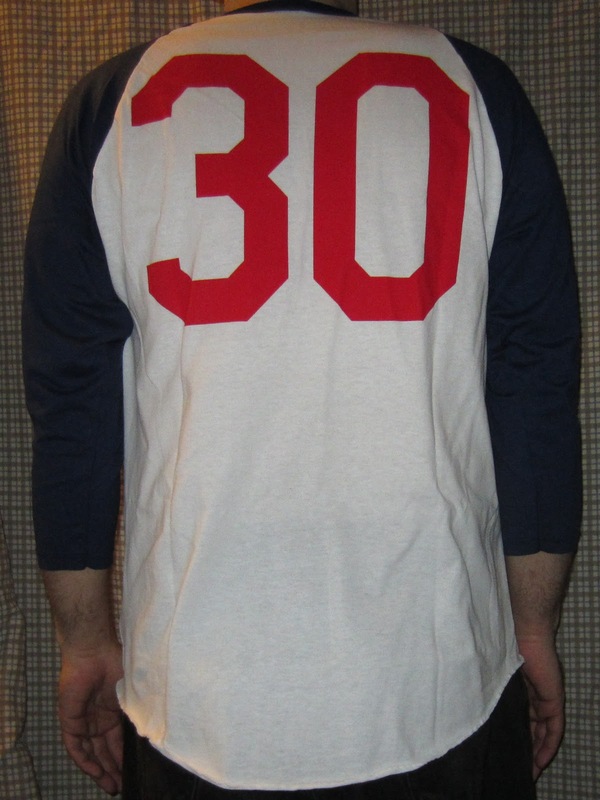 The back reads, "SINCE 1982" in the same manner. 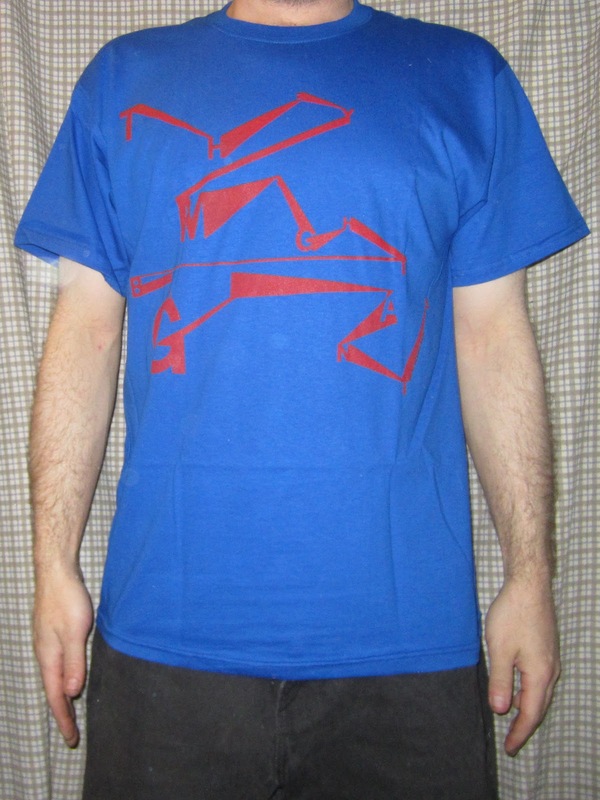 Celebrate 2012, They Might Be Giants' thirtieth year of Installing and Servicing Music in style. Purchase Nu Wave on Blue for the Nu Year now! Performed thirteen years ago at the now-closed Tramps in New York City, this traditional New Years Eve song was used to introduce the band. Happy New Year!! Check it out, people. It's a shirt for every week of the year. 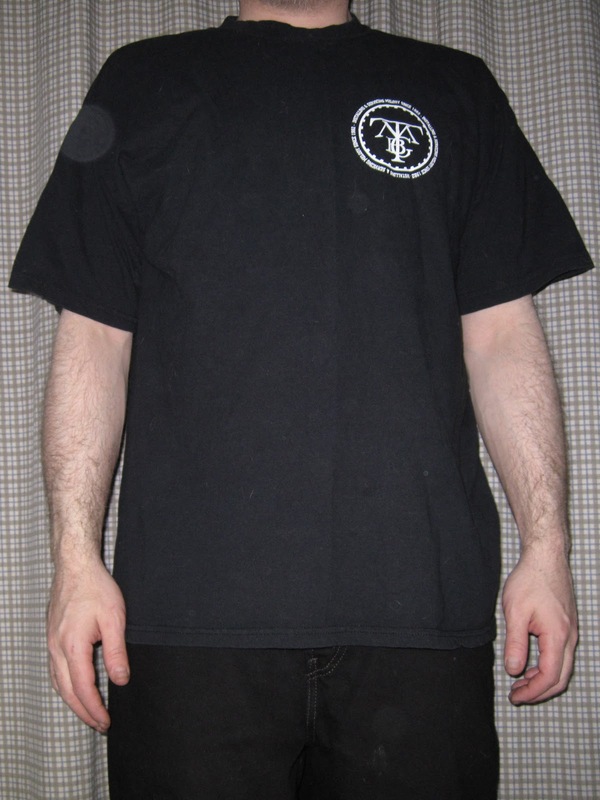 Fifty-two shirts and still going! 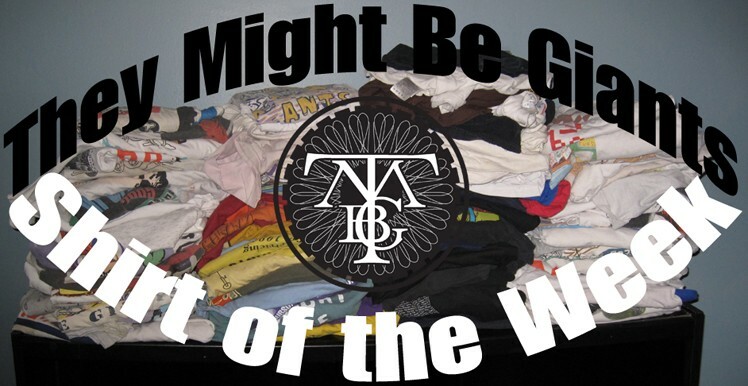 It's the TMBG holiday shirt. 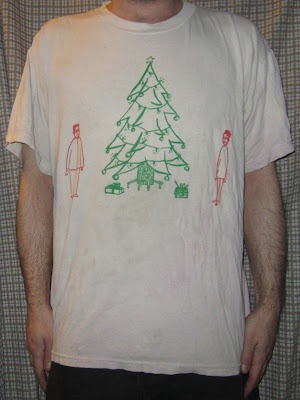 On the front are Flansburgh (left) and Linnell flanking a traditional Christmas tree, under which are two smallish gifts that are presumably from John to John and from John to John. The entire scene is depicted in a festive red and green. TMBG joined Harry Shearer and Judith Owen's Holiday Sing-Along at The Canal Room in New York City on December 15, 2006. They performed "Santa's Beard" for the first time in about a decade. The back of the shirt reads, "Happy Chanukah from They Might Be Giants". Here's TMBG's Chanukah song, "Feast of Lights", the other holiday tune that They performed at the Sing-Along. It was the first time that it was ever performed in front of an audience, for which John Linnell tweaked the lyrics a bit. Originally written as a Christmas song, this was performed at the Stone Pony in Asbury Park, NJ on 7/30/11. This shirt by Japanese artist and animator Hine Mizushima. It seems to depict some kind of bizarre telephone machine, complete with "TMBG" buttons and resident Giant squid. It conveys the message "Zei-Mai Daisakusen", or "Operation TMBG" for English speakers. The back features the band name in large letters and the Giant squid, who appears to be turning off a light switch. 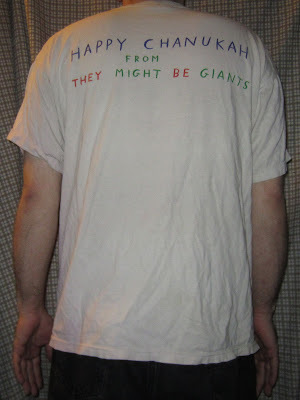 Here's what Hine had to say about her creation on her blog: "Perform your important mission for They Might Be Giants (hopefully after ordering and putting on the T shirt). Make sure it's not bugged by an enemy spy!" Purchase "Squid on Green" from the merch store. There's also a womans' version available. As a parting bonus, here's Hine's stop-motion animated video for With the Dark, starring that lovable Giant squid. Buy Album Raises New and Troubling Questions Now! Not to be confused with TMBG Street Team, this new addition to the Giant selection of shirts is number fifty. 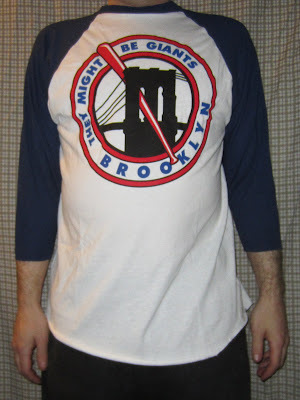 Representing our favorite Brooklyn "team", this 3/4-length sleeved shirt sports a section of the Brooklyn Bridge with a Giant baseball bat thrust through it. 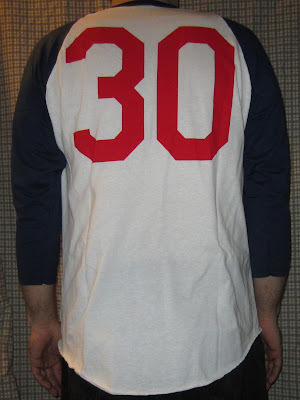 The back of the shirt has the number 30, presumably for TMBG's thirty years in the business, making this an anniversary shirt. Buy "TMBG Baseball 3/4 Sleeve on White" from the merch store today and join the team! 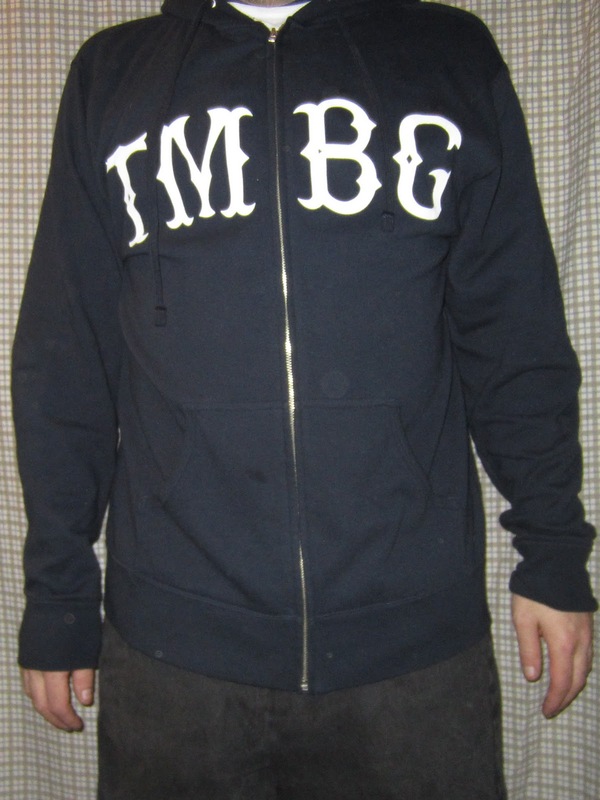 There's also a new hoodie that reads "TMBG" in the traditional baseball style. With matching cap, which I passed on since I do not wear caps. When will you make me a bucket hat, Giants?? 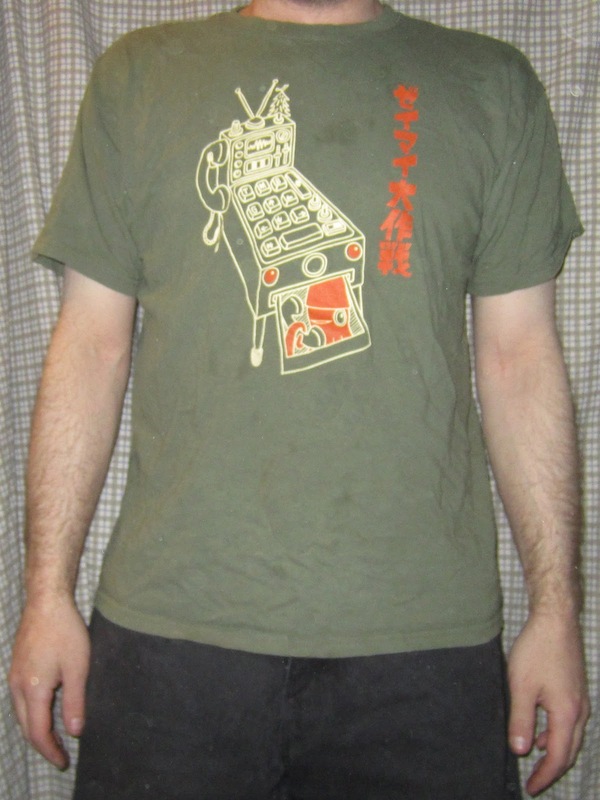 A fairly simple shirt this week, with the farmiliar TMBG logo surrounded by their slogan printed thrice: "Installing and Servicing Melody Since 1982." I would like to put the usual live content on hold this week to honor a very special musician. Logan Whitehurst was not just an amazing talent, but an incredibly giving person. Anyone that counted him as a friend knows what I'm talking about. Logan died of brain cancer five years ago today, at age 29. He was taken from us far too soon, and I for one will never forget his amazing work and generous spirit. I highly recommend you checking out Logan's music, most of which is available for free download on the Logan Whitehurst Music Archive, including the above cover of TMBG's Weep Day. 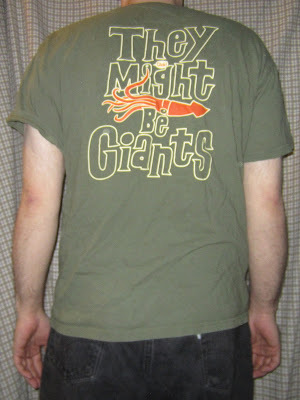 They Might Be Giants was Logan's favorite band, and it shows in his music. Sadly, I never had the chance to see him perform. His final album, "Very Tiny Songs" which is still available for sale consists of 81 short songs that were suggested by friends and fans of Logan. My song is the last on the album, because I submitted my idea two weeks late. He wrote and recorded the song anyway, and that's Logan for you. Please donate to the American Cancer Society in the memory of Logan Whitehurst.